This two-and-a-half-minute-long video is part of the brand's corporate social initiative #EducateTheGirlChild, in association with Nanhi Kali, an NGO. The music is by Shankar-Ehsaan-Loy. In an endeavour to create awareness for the cause of girl child education, Nestlé India has recreated the song, 'School Chale Hum', originally produced by director and screenwriter Bharat Bala for Sarva Shiksha Abhiyan in 2006. Through this song, Nestlé India aims to draw support towards the corporate social initiative - #EducateTheGirlChild, for which it has partnered with Nanhi Kali, an NGO imparting education to underprivileged girl children across India. In support of the cause, the musical trio of Shankar, Ehsaan and Loy put together a new composition along with lyricist Anvita Dutt and singer Harshdeep Kaur. Young girls from the Nanhi Kali program, also participated in the campaign by lending their voice to the song. Speaking on the partnership and the initiative, Suresh Narayanan, chairman and managing director, Nestlé India says, "Music is one of the most powerful and influential means of uniting people for a cause. This song represents the collective societal objective to spread awareness for girl child education." Bharat Bala of BharatBala Productions tells afaqs! that it took them almost a month to create this anthem. And understandably so, because the film was shot in the remote villages of all four corners of the country, namely, Kashmir, Rajasthan, Tamil Nadu and Sikkim. The visuals also show children being taught in vernacular languages. Commenting on the execution, Bala shares, "The visual treatment of this video is based on an insight from a research we conducted in rural areas. About 90 per cent children in villages go to school to meet their friends! That's how we decided to use the visual theme of kids hanging out together and having fun on their way to school and while in the classroom." Through the partnership with Nanhi Kali, Nestlé India is providing on ground support to girl children through necessary academic material and social backing under the aegis of the Nestlé Healthy Kids Programme. This has been augmented by identifying critical centres of education of the Nanhi Kali project and imparting nutrition education there. Highlighting the need for girl child education and with the intent to create awareness, Nestlé India conducted a three-fold campaign under #EducateTheGirlChild, starting August this year. 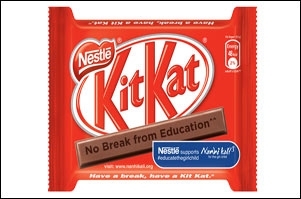 The company changed the brand properties of 100 million packs of Maggi Noodles, Kit Kat and Nescafé in support of the cause. The campaign also had an on ground activation, 'Run the Extra 100m' at the Airtel Delhi Half Marathon. What's with brands and music? Off late, whether it's CSR or a regular brand campaign, the long format, online route is being increasingly accompanied by elaborate music. It's almost like releasing a song, not an ad. For instance, Shankar Ehsaan Loy's 'Unbox Zindagi' for Snapdeal and Munch Machaa for Nestlé's new 'Crunchlicious' Munch, OLX's 'No more dekhte hain' with Amit Trivedi, Mercedes Benz Project X with A.R. Rahman and multiple brands such as Yamaha, Sonata and Hitachi associating with Punjabi rapper Badshaah for their 'musical' ad campaigns. Kawal Shoor, founding partner, The Womb, says, "Music has always been a part of advertising and there have been lot of anthems that multiple brands have done. However, I think, we have now become better at using it." On music being a part of creative briefs, he candidly adds, "Honestly I have never seen any client so musically informed to be able to say that it should be part of the brief." Sambit Mohanty, creative head, DDB Mudra, North, agrees. "When a brief is cracked, the creative execution is never a mandate from the client. It is part of the creative process where the creative mind behind the campaign feels that a jingle would probably have more cut through and a better reach out to the market than a story," he states. However, Devang Raiyani, national head of strategy, Indigo Consulting, has a different viewpoint. "We see client briefs clearly calling out formats like these. It boils down to the fact that getting through to the audience is becoming increasingly difficult with the regular 20/30-second spots. Brands are pushing for branded content where the message is woven in an entertaining way. Compelling scores help make this line between the medium and the message blurry and help cut through," he notes. Raiyani expects to see more such campaigns in future.